The Bluegreen Vacations Club condo-style property, 372 East Tropicana Avenue, provides excellent facilities, including a crystal clear indoor swimming pool and sun deck. Bluegreen Vacations Club 36, Ascend Resort Collection, is perfectly situated lying just minutes away from both the McCarran International Airport and East of the legendary Las Vegas Strip. This makes it a symphony of both fun and relaxation, offering something for everyone: The Strip offers access to world-famous casinos, such as the Bellagio and The MGM Grand, incredible shops and wild entertainment; while the accommodation, allows its guests to kick back and relax. The Bluegreen Vacations Club condo-style property provides great facilities for all its guests, including a crystal clear indoor swimming pool and sun deck where you can catch some rays; along with an up to date gym, replete with modern equipment; and if you feel like a bite to eat you can choose from one of the four on-site restaurants. 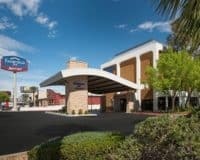 It also offers free parking for any guests who have either rented a car or brought their own, allowing you to venture out of the city and see some of the stunning sights of Nevada. The hotel itself will make you feel completely at home, offering the choice of one or two-bedroom suites that come with fully stocked kitchen facilities. Club 36 rooms also come with televisions that are equipped with cable, along with a washing machine and tumble dryer which mean that you will always be able to wear your flashiest outfit during your night out in Las Vegas. Accommodation at the Bluegreen Vacations Club, is relatively cheap and right in the center of Vegas, making it ideal for party people who want to sample all the delights that Las Vegas has to offer.